Often culture is spoken about as being a key USP (Unique Selling Point) for tourism destinations, but the will by Governments to keep positioning their culture on centre stage is not often as evident as it ought to be. In Seychelles the promotion of the island’s culture is today central to the Tourism Board’s marketing strategy. This ever since they moved away from only selling Seychelles as a sun, sea and sand tourism destination. 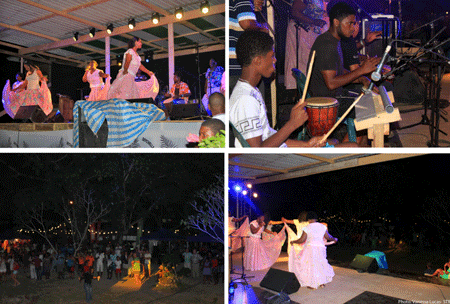 During the last major cultural event of the Seychelles that was held last weekend on the island of La Digue it was clear that the La Digue District Administration had moved to ensure that the culture of the islands was clearly positioned at the centre of the celebrations. “After the official opening ceremony when artists and performers who consider themselves as Diguois entertained the thousands who had travelled to the island it was the turn of the MOUTYA Groups to take centre stage for the second main night of activities of Sunday night. The Fernande Ladouce group “Masezarin” followed by Bwa Ver who were mandated to be the show group for the night” said Minister Alain St.Ange, the Seychelles Minister responsible for Tourism and Culture before adding that it is one thing to say that we appreciate our culture, but it is another thing to be seen to be supporting what we have as our culture. The island of La Digue is a key part of the tourism attractions of the Seychelles and it is the island that is often referred to as the traditional home of cultural assets.